Hello everyone, welcome to my second blog post. I wanted to start off with a diagram that I should have included in my last post. It shows an overview of the world’s energy budget, which includes several terms I described before, including the albedo effect and the greenhouse effect! 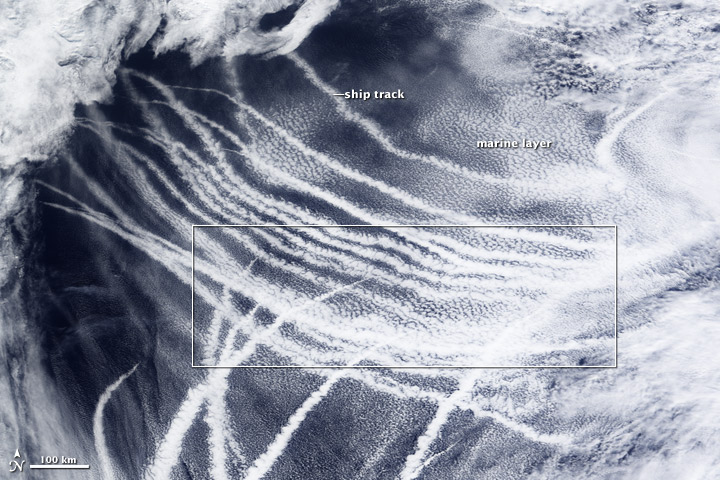 Original image found on the NASA website here. In this post I want to explain how the Earth’s temperature is affected over longer timescales as a result of changes in its orbit. 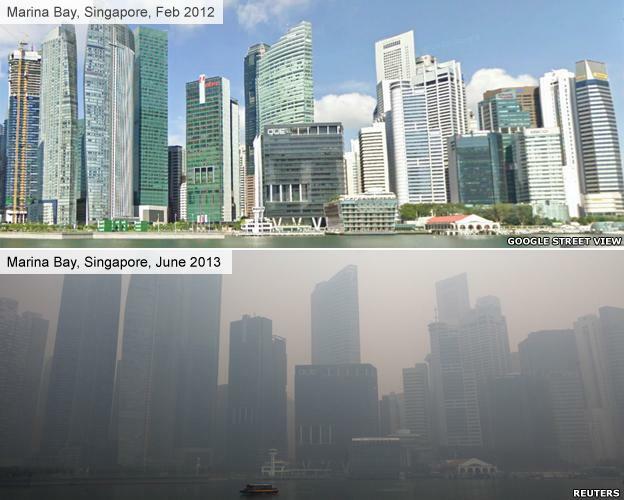 These changes can have a significant impact on the Earth’s climate and temperature. The variations in the Earth’s orbit were first discovered by a mathematician named Milankovitch in the early 20th century, whose theories were confirmed in the 1970s. However, to understand why these cycles have such an effect on temperature I should first review the Earth’s annual cycle and why it has seasonality. The Sun emits energy which travels to the Earth as rays. The amount of heat generated in the atmosphere depends on the angle these rays hit the Earth (their angle of incidence). The figure below shows an example of how the Sun’s rays reach the Earth at two areas. 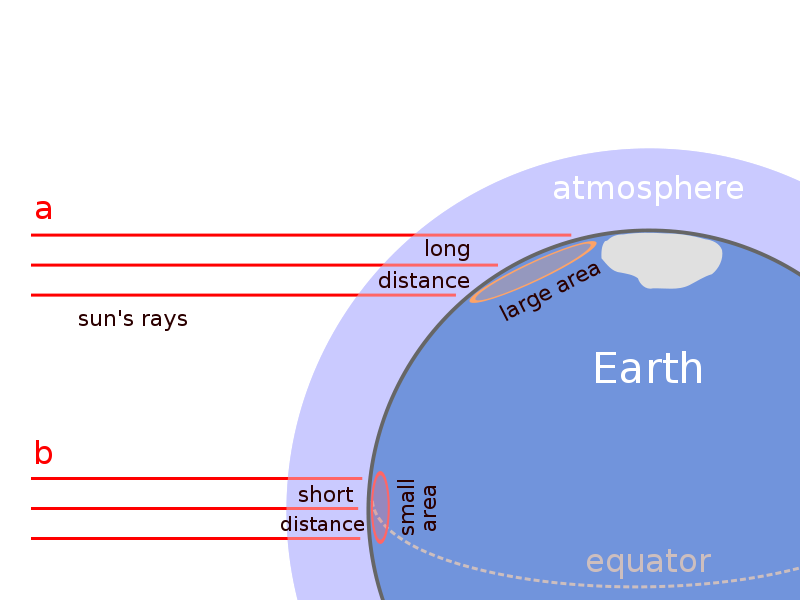 The rays around the equator have a much higher angle of incidence (~90⁰ in relation to the Earth’s surface) and so they cover a relatively small area. In energy terms there is a higher Watts per metre squared value (Wm-2). The rays that reach much higher latitudes have a lower incidence angle and therefore diffuse themselves over a larger area (lower Wm-2). This combined with the Earth being tilted on an axis explains our seasons (NB. Not represented in the figure). In northern hemisphere summer time (NHST) the North Pole is tilted towards the Sun and so the northern hemisphere experiences incoming rays at a high angle of incidence. The opposite occurs northern hemisphere winter time (NHWT). The Earth’s orbit around the Sun is not spherical but in fact elliptical. 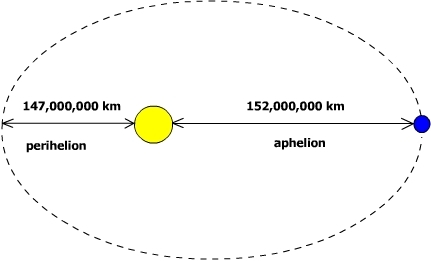 When the distance between the Earth and Sun is greatest this is called ‘aphelion’ (see figure below) and when it’s at its shortest, ‘perihelion’. The elliptical orbit can vary greatly. 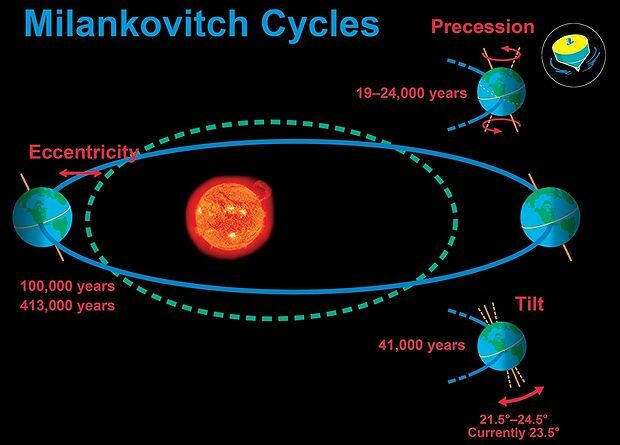 The two extremes of the Earth’s eccentricity can be seen on the diagram summarising the Milakovitch cycles below. The variation between summer and winter temperatures is at its most extreme when the difference between aphelion and perihelion is largest. The time it takes for the Earth’s orbit to change from its most elliptical shape to its most spherical and back again is ~95,000-100,000 years. This period of time is known as its cycle. The Earth’s axis is currently on a tilt of 23.45⁰ however this can vary from 22.1-24.3⁰ over a ~41,000 year cycle. When the angle is decreased the difference between summer and winter climates is less extreme. As well as the Earth’s axis being tilted it also wobbles about this axis. Think of a spinning top just before is comes to a rest. Currently the North Pole is pointing towards the North Star, however in ~12,000 years’ time it will be pointing in a completely different direction which will make NHWT in June and summer time will be in December! A full cycle takes 19,000-24,000 years to complete. As the precession is effectively swapping our seasons this has a large impact on the temperature of the Earth, as well as its climate. Original image from the UCAR website found here. For those of you who read my first blog post you will recognise the next figure but hopefully now the cycles in the Earth’s temperature will make more sense to you. You can definitely see the impact of the Milankovitch cycles within the plot. 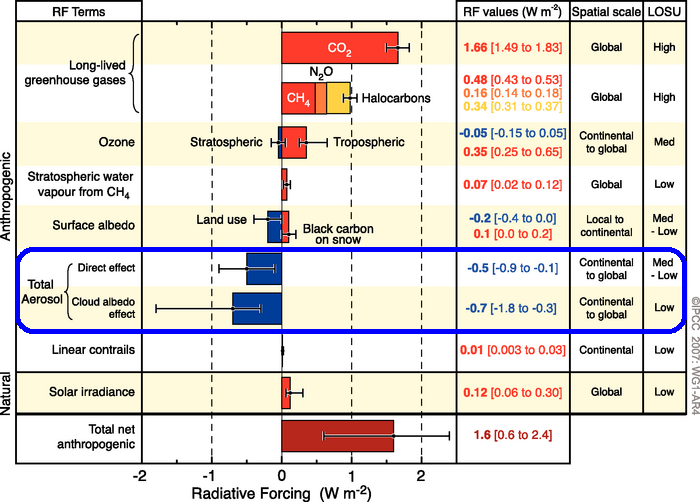 These sorts of temperature plots have sometimes been used by climate sceptics to show the degree of natural variability in the Earth’s Climate and how current climate change is minimal compared to the past. This is extremely difficult to justify, especially when comparing two extremely different timescales. As you can see from the plot below we are actually in one of the Earth’s warmer periods on this timescale, so if anything we should be expecting Earth to be moving into a cooler period in the future. However the rate of global warming we have experienced in the last 150 years has not occurred for several million years. As I said in my last blog post I will do a future post about the history of the Earth’s temperature in more detail, however next time it’ll be more chemistry with a brief introduction into aerosols!